We are pleased to be able to offer high quality retractable and canopy garage doors manufactured by Hormann and Garador at discounted prices. 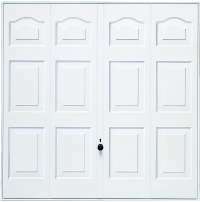 These doors have a full 10-year warranty on both parts and surface finish. 1. We can deliver retractable and canopy doors from both Hormann and Garador free within the orange area on the map. 2. We can deliver doors from Garador nationally for a £35 inc VAT charge. 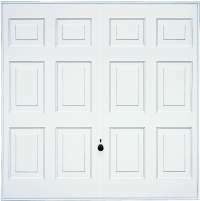 (Note: Hormann sectional doors can be shipped nationwide). Contact us if you are unsure about these charges. Delivery will be approximately two weeks after placement of order, although some doors are in stock and are therefore quicker. The prices below include VAT are on a supply only basis, we would be pleased to quote for installation if you live in the orange area on the map. The sizes below are the most popular sizes so if you need something in a different size then please call or email us for a quote, for example Garador have a 'made to measure' service. We sell garage doors from lots of other manufacturers (Cardale, Henderson, Apex, etc) so if you have a specific requirement then please call or email us for a quote - you can use our easy quote form which will prompt you to give us the correct info so you can give you an accurate price first time. 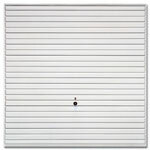 Powder coated galvanised steel doors finished in white or brown - these doors are fully finished and do not need painting. They come with a comprehensive 10-year warranty that covers both parts and surface finish. In our opinion this is the best built canopy and retractable garage doors on the market. Available pre-fitted to the steel frame - see prices below. Single doors: £25 for a brown door (7' and 7'6" wide only), £70 for other colours, add £45 for four-point locking security upgrade (standard door has two-point latches). 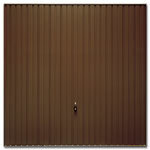 Double doors: £45 for a brown door, £120 for other colours. SORRY THESE PRICES ARE A LITTLE OUT OF DATE - PLEASE CALL FOR LATEST!!! 14' x 7' or 6'6"
Notes on frames: Hormann doors have 75mm frames on retractable doors, canopy doors can have either a 60mm or 75mm frame. Garador retractable doors have 70mm frames whilst canopy doors have 54mm frames. Other designs are available, other sizes are available. !!! Special offer !!! Reductions on Hormann Promatic and Supramatic E electric openers when purchased with a retractable or sectional door on a supply only basis. Promatic £250 inc VAT and delivery, Supramatic E £295 inc VAT and delivery.